Inhaling jump or step open to the right, feet about 5’ apart, stretch the arms out wide at chest level, swelling at the chest. Exhaling turn the right foot out and left foot in, bending your right knee to 90o keeping your knee aligned above your ankle. Your hips should be lower than your shoulders. Place your hand, palm flat if possible, on the floor by your out-step. Stretch your left arm straight out over your left ear, gaze toward your left fingertips, cheek tucked into bicep. Spiral torso upward; starting at the hip spiral open to the shoulders, heart light shines upward. Breathe deeply into the left side of you body, creating length from the outer edge of your left foot out through your fingertips. Pay special attention to lengthening your left waist between the hips and ribs. Note of caution: Keep head aligned with spine, DO NOT LET HEAD HANG, this can be stressful on a misaligned spine. Come up on an inhale turning your feet, exhale bend your left knee and repeat to the left. Inhaling come up from Parsvakonasana, again turning your feet, right foot out to 90o left heel swivels outward, slide your left arm outside your right thigh bringing your underarm to your thigh, arm behind the knee, torso should be tight into thigh. CLEAR YOUR ENTIRE CHEST PAST YOUR THIGH. Option 1: Place your hands in prayer position, left elbow pointed down, right elbow pointing upward, prayer (hands) in the center of your chest. Option 2: if you have full underarm thigh contact with your hands in prayer position then you are ready for the final posture; reaching your left hand for the floor, palm flat by your out-step. Right arm extends overhead, bicep in front of cheekbone. Again create a spiral from the hip to the shoulders, moving the crown of your head away from hips creating length in the twist. Drishti or gaze point, if your hands are in prayer position gaze is upward out the right corners of your eyes. If you are in the final position gaze is at the palm of your right hand. To lift the left heel or not?? Traditional Ashtanga Yoga has us keep our back heel grounded. However I have found that I get better alignment of my hip and waist if I allow the back heel to lift slightly, the lifting of the back heel lets the right hip move back and the right waist lengthen–but I still turn my back heel toward the floor and press through it. Inhale come up, turning your feet, exhale and descend to the left side, holding again for 5 breaths. Inhale come up, square off your feet, exhale to Samasthitih. These asana stretch and strengthen the back, legs, and hips, and create length in the spine. They purify the ribs and lower abdomen dissolving fat around the waist, and soften the limbs so that subsequent asanas can be more easily practiced. 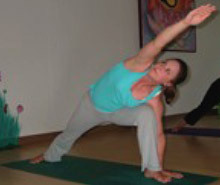 As with the previous poses, the twist stimulates digestion, relieves constipation, and corrects breathing difficulties. These asana tone the nervous system and strengthen the spinal cord.